In the far distance of prints 1-3 and 1-4 Hokusai masterfully pans along Edo bay, first across the open passage from Edo bay to the Pacific Ocean, and then across the coasts of the Japanese provinces of Awa, Kazusa, and Shimōsa (as they were then called) forming the south eastern, eastern, and northern parts of Edo bay. 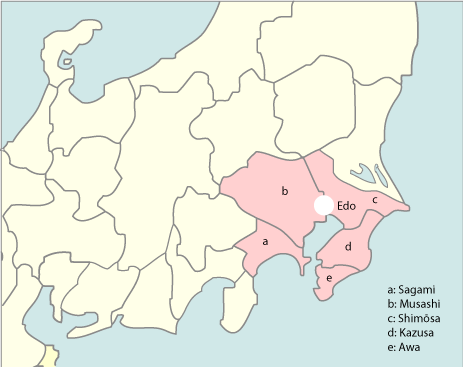 In the mid distance of print 1-3, fishing boats from Tsukudajima island (佃島) (shima or jima meaning “island”) can be seen sailing down the coasts of these three provinces. The sterns of all these fishing boats are also adorned with a kadomatsu. 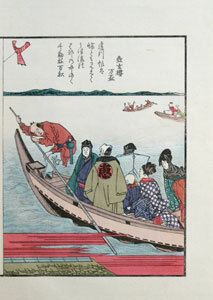 In the foreground a ferry has left the misty coast at Takanawa, and is on its way to the city of Edo. 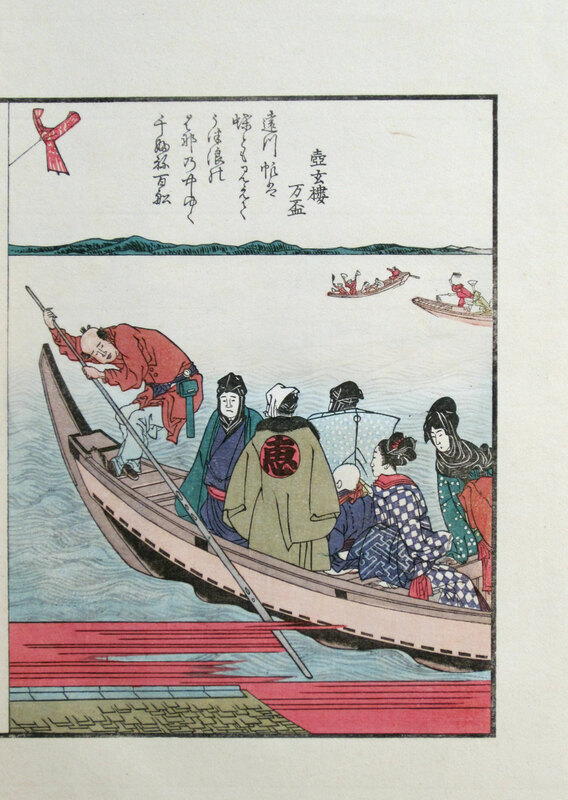 In Japanese, a ferry is called a watashibune (渡し船), which literally translates into “crossing boat”. 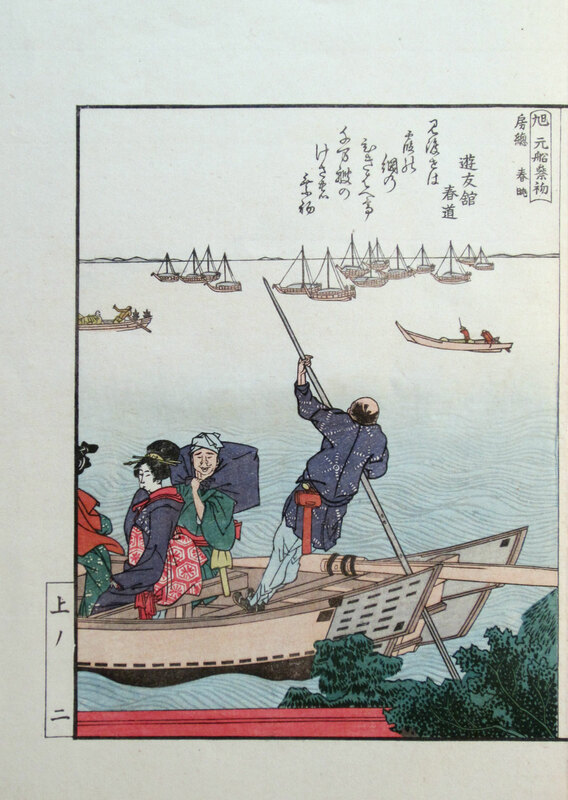 When the water was shallow, these flat-bottomed boats were propelled by oarsmen in the front and stern using long poles made of bamboo as is the case here. When the water was deeper, the broad rudder in the stern visible in print 1-3 was lowered into the water and then vigorously swept from side to side to move the boat forward. Nowadays Sagami is part of the Kanagawa prefecture, Musashi belongs to the Saitama prefecture, Edo to the Tōkyō prefecture, Shimōsa to the Chiba/Ibaraki prefectures, and Kazusa and Awa are both part of the Chiba prefecture.